Do you think we're going to see Luke cameo on Tatooine. At Tosche station perhaps? It will be both great and hilarious. Lol.... 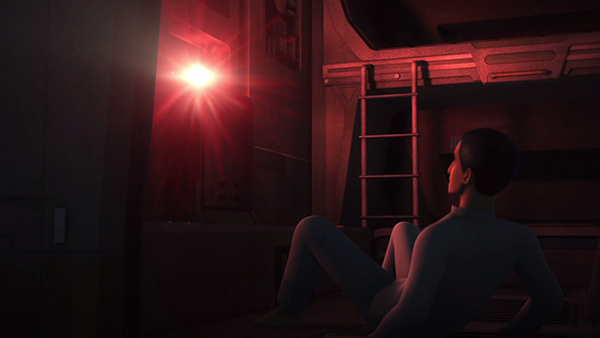 I forgot all about Chopper and AP-5's freighter theft.....that was a really sweet and fun episode. As for the Obiwan-Maul episode, I have this weird headcanon that Maul and Obi will have a brutal battle where both get badly injured....then Maul taunts Obi about Satine, Obi gets enraged and defeats Maul....Maul tells Obi to kill him and be done with it....but Obi says he forgives Maul and doesn't kill him. Then they are attacked by Tuskens....as they are overwhelmed due to their injuries, Maul force pushes Obi away so he can escape and then Maul fights the Tuskens alone until he dies... that would make me sad but would give Maul a very hopeful and honorable ending but let him remain a dark side user. Exciting! 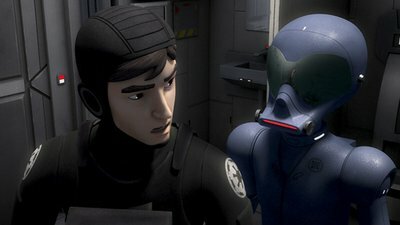 It looks like clan Wren is going to join the Rebels in the fight against the empire. Someone posted a trailer for the season 3 finale on the Making Star Wars site. - We get to check out a "refresher"/space loo in SW.
- Hera got to bring out her Mom side and teach imperials not to mess with her loved ones. - They changed the scene briefly before the villain's head exploded but we got to see his eyeballs go white (pushing the envelope for an animated show). It reminded me of Remi's death in Empire's End. - And my favourite scene in the whole show...AP-5 floating with baby Neebrays in space and breaking into song. Yes it was a fun episode! Loved the AP-5 scene. Pablo Hidalgo? Now that you're saying it @jakkusun , it's true. I kept wondering why he looked familiar. I love when Hera gets angry. Go girl! But where is Kanan? I miss him The AP-5 scene at the end is so unexpected, but it works! Cute. I haven't seen the entire episode yet, but I couldn't help but spoil myself by watching a clip of the duel, and I thought it was perfect in all its minimalism. I thought it did justice to Obi-Wan's character, and I found it very moving how Maul realised in the end who the real enemy was. A poignant end to a broken man - to some like Palpatine, the Dark Side gives power, and to others, it gives nothing but pain, anger and insanity. Just watched it. 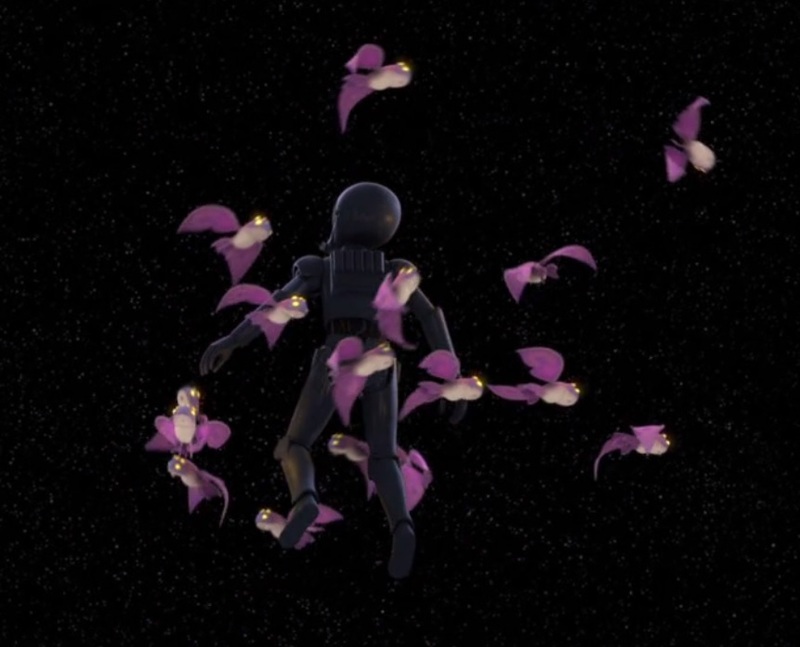 As I haven't been in Rebels so much, I didn't know what to expect. The episode worked for me. I liked the trigger Maul used to provoke Obi to fight. Something that made me think about Luke on Anch-To: Hera telling to Ezra : "Do you really think that If General Kenobi was alive, he would hide on some backwater planet instead of fighting with us?" Same question fans have been asking since TFA - what's the real reason of Luke hiding on Anch To. One more thing I don't think I understood: Dying Maul asking Obi was it The Chosen One? Is this a reference to Luke? to Anakin? I thought Obi-Wan originally believed it was Anakin, then believed it was Luke instead, and then it turned out it was Anakin after all... or something. Then again, Luke and Anakin were both necessary pieces of the puzzle - without Luke the Sith wouldn't have been destroyed, so Obi-Wan wasn't wrong to say that, exactly. @Darth Dingbat wrote: I haven't seen the entire episode yet, but I couldn't help but spoil myself by watching a clip of the duel, and I thought it was perfect in all its minimalism. Same here, I just had to spoil myself and watch the clip. And I agree about it being well done. I didn't need a battle, I needed the emotional closure and mutual respect between Maul and Kenobi. The music was also really good. Also it's really hard to tell that Kenobi even sliced Maul? It seems most ppl say that is what happened, so I suppose it did, but I kind of prefer to think that he died because when it came down to it, he realized he didn't really have the hatred he was trying to hold on to anymore, and by losing that hatred, he lost the only thing really keeping him alive. :/ it doesn't really make a lot of sense but I prefer it as a headcanon I guess. Though he still wanted vengeance even with his dying breath, but he seemed to have forgiven Kenobi. I guess I just wished for him to have progressed away from obsessive revenge, but I suppose part of the tragedy is that he never does escape from the revenge cycle. But that's just my self-indulgent wishful thinking. xD I think it was really well done. I like how people are talking about how it is like samauri movies, where the battles are short like that. I cried when I watched the clip, tbh, because it's just so dang tragic. Watched the clips....it was an excellent episode! I had all these headcanons of Maul sacrificing himself, Ezra plunging into the dark side by killing Maul, Kenobi giving Maul another drubbing...but what we finally got in their final confrontation was unexpected and really good. It is also a little sad seeing Maul finally die... since the poor guy was kidnapped by Palps as a little child, he never got to experience much happiness (though he did experience some love from Talzin especially when she sacrificed herself for him). I also agree with @jakkusun - I'd like to think that Maul didn't get killed by Obi-wan but let go of his hate and gave up his desire to live, a little like Darth Sion in the EU. Maybe the force revealed this to him as Obi defeated him and cut his lightsaber? I got a lump in my throat when Obi held a dead Maul in his arms and the Moons formed a spotlight over them. - I think Maul was referring to Anakin, not Luke as the 'Chosen One'...I think it has been confirmed that Anakin is the Chosen One....Also, technically Anakin avenged Maul, Obi-wan etc. by destroying Vader (within himself) and Palpatine, ending the Sith Order. - Kenobi tells Ezra him that the future changed with his turning up on Tatooine- will this have some implication on the long term fate of the Rebels crew? @panki wrote: Watched the clips....it was an excellent episode! That's why it confused me. I understood the Maul question as who did you protect? The Chosen One? Obi's answer is yes - but it's obviously not Anakin he protects, but Luke. Was it one of Kenobi's trade marks: The Chosen One - but from certain point of view? It could definitely be one of Obi-wan's certain point of view replies.....maybe he is indirectly protecting Anakin by bringing him back to the light through his son? Actually, given the ANH Kenobi I don't think so. I have an impression that Obi lost all of his hopes regarding Anakin (more machine than a man). Luke's success with Anakin's redemption was actually based solely on Luke's feelings, hopes and determination. And all it was in completely contrary to Kenobi's and Yoda's advices. You could be right....I'm going on the old novelisation of ROTJ but in it Obi-wan waiting to teach a dying Anakin the secret to becoming a force ghost and declares that he fulfilled his role as the chosen one so my thinking is that Obi-wan never quote gave up hope on Anakin (even keeping his old lightsaber instead of leaving it on Mustafar). It was after the redemption moment not before - and it was something confirmed by Pablo that Anakin got a little help from another side how to become a Force Ghost. I think as well that keeping the lightsaber was a sentimental move by Obi, or he already had future plans with it - he knew that Anakin would become a father very soon. That would mean Obi-wan was wrong and misunderstood the prophecy of the chosen one, I guess....I could live with that....I know it is canon Anakin got help from Obi-wan to become a force ghost....but I still am on the fence as to how irredeemable Obi thought Anakin/Vader was....maybe I am drawing a parallel to Dark Disciple, but Ventress is in a similar situation where she takes Vos's lightsaber just before he turns to the dark side...she later returns it to him explaining that she was keeping it safe for him till he returned to the light side again.....so wouldn't the same logic apply here as well? I agree with your reading of it. Slightly off on a tangent but still relevant - I once asked Pablo if Force ghosts were all knowing and he said they were not because of how wrong Obi-Wan was about Vader being past the point of no return. So it seems like Obi-Wan had given up on Anakin during his lifetime and didn't even gain any other worldly foresight into the matter when he became a force ghost. Also on my gosh I can't believe the Star Wars Twitter posted this maul tribute and they made a maul shrine on recon. Idk if I should laugh or cry oh my gosh. On another note, did anyone else notice the nod to two scenes in Rey's vision sequence in the episode? There are a lot of similarities between Ezra and Rey's lives, with this one being the latest. Luke and Anakin don't have as much in common with Rey as Ezra does.